Has your wheel or rims seen better days? If your rims are bent or have cracked spokes, if their shine has been obliterated with ground in dirt and grim, if the finish is coming off or they’ve taken a beating from curb hits, our experts can restore them to like-new condition. If you own aluminum rims or wheels, we can repair scrapes, discoloration, bends, and cracks, as long as the wheel is safe to drive. Wheel reconditioning and polishing is much more cost-effective than replacing your wheels and can breathe new life and years of good looking service into your existing wheels and rims. At Rick’s Wheels, we provide expert alloy wheel polishing that produces a bright, high luster finish and shine. Our years of wheel refinish and polishing experience guarantees to transform your dull, road worn and scraped wheels so they shine like new again. Our alloy wheel polishing service includes wheel inspection for structural damage to ensure your wheels are safe to repair. After inspection, wheels with structural imperfections, curb scrapes, and other surface damage and prepared for polishing. 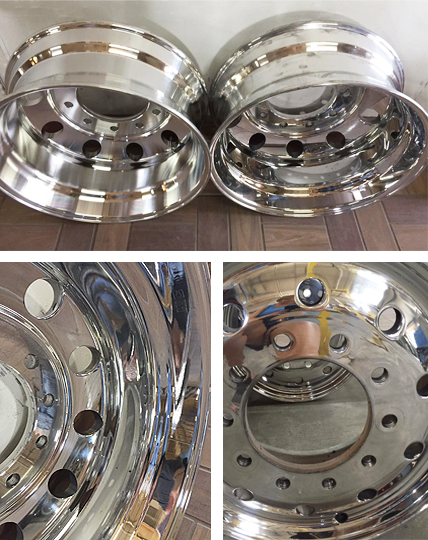 After the wheel is polished, a top clear powder coat is applied for a long lasting, durable finish. 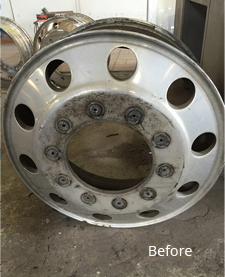 When your aluminum or alloy wheels need cleaning and polishing, contact us. We’ll show you just how good your wheels can really look.